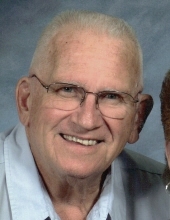 Douglas G. Brown, age 83 of North Branch passed away on Sunday, April 7, 2019 at his residence. Douglas George Brown was born on November 4, 1935 to George and Cora Brown on their farm in St. Croix Falls, Wisconsin. He attended school in St. Croix Falls, Wisconsin where he met the love of his life, Donna Cross. They married in 1956 and had three beautiful children Jim, Don and Laurie. Doug worked as an electrician, construction worker started his career as a Police Officer while they made their home in St. Croix Falls. In 1963 he and Donna moved their family to North Branch where he accepted the position of Village Marshall and not long after that he became the Chief of Police. After taking a brief hiatus he realized how much he missed being a Police Officer when he was asked to return to public service in the roll of Undersheriff of Chisago County for a few years in the late 70s. When North Branch went back to having their own Police Dept. in 1983 he was asked to return to his position as the Chief of Police where he continued to serve until his retirement in June of 1996. While he enjoyed serving the people of North Branch he especially took pride in his years working with the youth. It was because of his work with the youth that he became one of Minnesota’s first D.A.R.E. Officers/Instructors and taught it in the North Branch Schools. Doug also served North Branch as a Volunteer Firefighter for over 28 years. He is so proud of all three of his children and all of their accomplishments but it was a special day when his son Don became Fire Chief. He was a member of Trinity Lutheran Church, a member of the Minnesota Police & Peace Officer Assoc., and the Minnesota State Chiefs of Police Assoc. as well as a Lion member. After he retired (to keep busy) he did Security work and was a parts runner for Bauerly Brothers which later became Knife River Corp. He also spent most of his early mornings enjoying having coffee (diet Pepsi) with his friends at the County Market Deli. But, from day one his biggest passion was his sports, participating and especially watching family members. Doug and Donna spent several winters with their snowbird family down in Florida. They also loved camping with family in the summer. In 43 years they never missed a Brown Family Reunion Campout. Doug is preceded in death by his parents George and Cora, his sisters Luella Sundeen, Marjorie Voge, and Marilyn Kaiser, his brother John and his great grand-daughter Mackenzie. He is survived by his wife Donna, their children James (Robyn) Brown of Hugo, Donald (Karen) Brown of Winona and Laurie (James) Rod of Dickinson, N.D., sister Carol Northquest of St. Croix Falls, WI, and many nieces and nephews and many Grandchildren, Great Grandchildren and Great-Great Grandchildren. To send flowers or a remembrance gift to the family of Douglas G. Brown, please visit our Tribute Store. "Email Address" would like to share the life celebration of Douglas G. Brown. Click on the "link" to go to share a favorite memory or leave a condolence message for the family.